When Chareva and I were first engaged, she warned me not to marry her for her cooking abilities. At the time, it was a fair warning – not that I cared. Considering that it took me 25 years of dating to find someone I wanted to marry, a lack of enthusiasm for cooking wasn’t exactly a deal-breaker for me. 1 6 oz can of tomato sauce (canned tomato sauces tend not to have added sugar). Cut the eggplant into 1/4 to 1/2 inch thick slices. If you have the prep time, you can coat the eggplant slices with salt and let them sit for an hour to extract any bitter juices, then rinse clean and squeeze dry with paper towels. If not, skipping this step doesn’t seem to affect the final taste much at all. Rub both sides of the eggplant slices with olive oil. Place on cookie sheet and bake for about an hour in a 325-350 degree oven. 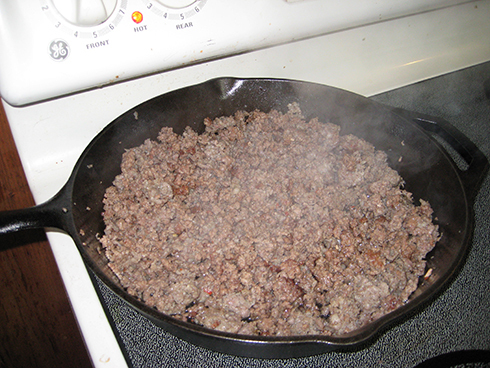 While the eggplant is baking, brown the ground beef and sausage together in a pan. 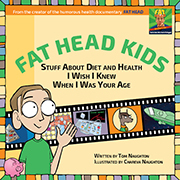 Pour off the extra grease – nothing wrong with eating fat, mind you, but you don’t want the lasagna to be runny. Make the white sauce: In a medium bowl mix together 12 oz ricotta cheese, 1/2 cup Parmesan, 2 eggs, Italian seasoning, onion powder, garlic powder, and parsley. 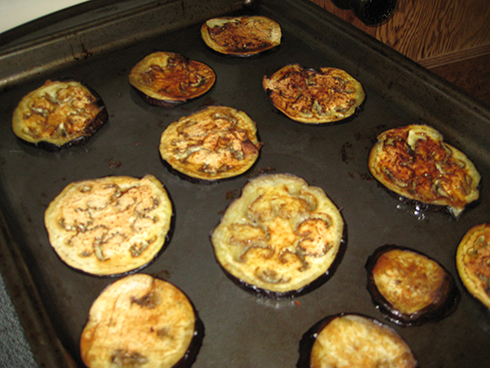 Remove the eggplant from the oven once it has browned on both sides. (You may need to turn the slices halfway through baking). Bake the lasagna for about an hour at 350 degrees. 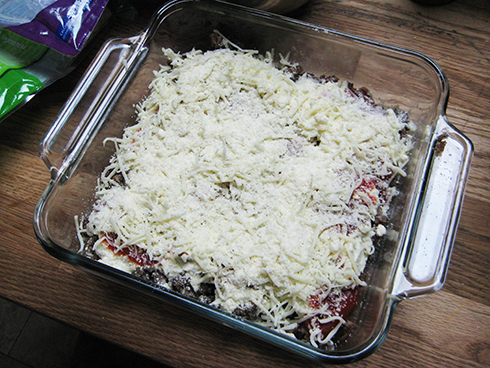 It’s ready when the top layer of cheese begins to brown. Let it cool for 15-20 minutes so it becomes firm before serving. Makes great leftovers and a very convenient packed lunch for the kids and hubby the next day. 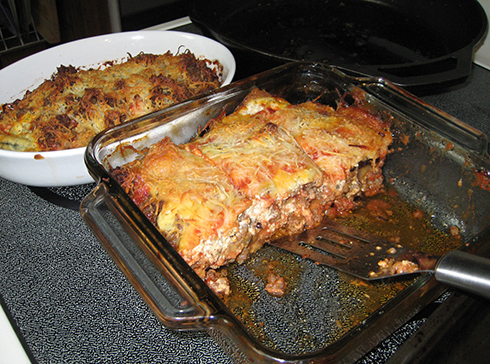 It tastes more like lasagna than moussaka. It’s got mozzarella (moussaka doesn’t), no lamb meat, cinnamon or nutmeg, and it’s heavier on the tomato sauce and lighter on the white sauce. Judy Barnes Baker has a great low-carb moussaka recipe in her “Carb Wars” cookbook. If I could eat that much dairy without my face breaking out, I’d love to make this–it looks so good! You’re pretty persistent, spending 25 years dating. I gave up a long time ago. I’d pretty much given up when I met Chareva. I wish I could figure out the heating and time conversions to cook this in my convection oven. Tom what up with the the Harris Teeter carton did they coyotes finally get the hens too? No, fortunately. We saved some egg cartons for our own eggs. We also ended up buying eggs now and then during the cold months when the chickens didn’t produce nearly as many. That looks awesome! I am not an eggplant fan, but I am going to give this a try! Thanks again for posting! Have you thought about putting together an e-book with Chareva’s recipes, I wouldn’t hesitate to buy it. Maybe someday when she has enough recipes written down. Yum. I have to try this one. If I understand your issue, the 325-350 would convert to 160-175 degrees celsius. When cooking convection, I tend to drop the temp about 20 degrees C relative to conventional. Forgive me for being an ingredient snob (and given that I haven’t eaten this so can’t comment for it’s taste or your palate) but wouldn’t this take off with fresh herbs, garlic, onion and freshly grated parmesan? Do you have a herb garden? I’ve made the switch (when possible) to fresh ingredients and the flavour improvements are huge. Rosemary, thyme, parsley and mint can all grow like weeds, and basil and chives are pretty easy to grow in most climates. The difference between a store brought paste for a Thai green curry (full coconut cream please) and the exact same curry cooked with a handful of chopped fresh coriander leaves and stems before serving is immense. I love garlic and onions, but can’t stand their powder forms and the volatile flavour content of parmesan is destroyed when it’s ground up like that. Make the most of the variety that a garden can throw at you. We don’t have an herb garden yet, but it’s on the to-do list. What had what appeared to be onions growing around the property, but they don’t taste good. They’re probably not onions. Hmm. Adding eggplant to the list of veggies I’ll be growing after we move away from TN. Moving way from Tennessee? Say it ain’t so. You can just pan fry eggplant in butter instead of all that oven time. I pan fry eggplant then stack like pancakes with bolognaise sauce thru the layers and over the top. It always gets a great reaction from family or guests and is easy! I’d have called this moussaka too. And I don’t ever salt the eggplant as there’s never any difference. It was very timely. I’ve bough an eggplant with the intention to make some layered casserole dish just before I read your post. 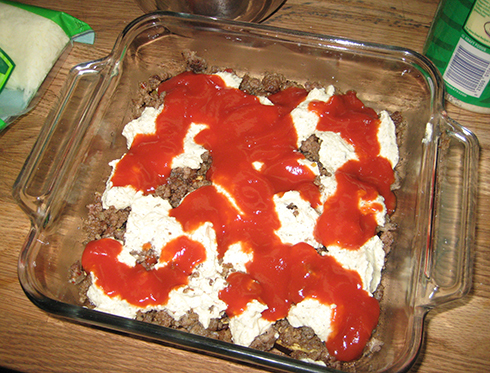 The idea of adding a sausage to the ground meat is excellent. I often pre-cook my sliced eggplants in a Foreman grill in batches. I love eggplant, I found it worked better as a pasta substitute in appropriate dishes than zucchinis. Eggplant is right up there with liver in my book — I can eat it if it’s disguised with enough other stuff. This looks like it just might do the trick. It looks wonderful, as a matter of fact! I don’t mind eggplant by itself, but I’m with you on the liver. Chareva hides it in her chili and I can’t taste it at all. I’ve made an eggplant parmesan that’s rather similar in taste. 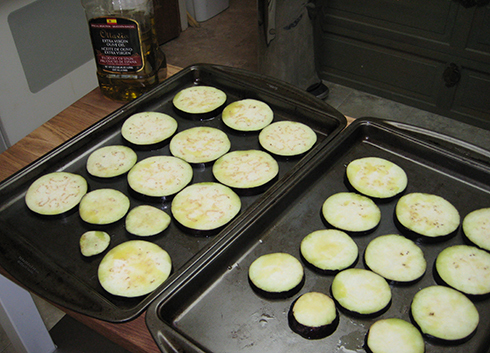 We use ground golden flax seed to “bread” the eggplant slices, then bake or fry them before assembling the dish. I seem to be an out-lier in that I loooooooooooooove eggplant and will love to try this! Yep. Moving from Signal Mountain (Chattanooga) to warm, flat Orlando. Gardening can be tricky here due to shallow soil and we like the idea of actually being able to have some “cold weather” crops during the FL winter. Did I mention its warmer? I will miss all the trees though. That is for sure. I would definitely miss the scenery around here if we moved to a flat area. Good luck in Florida. Might want to switch from canned tomato anything. Apparently, that industry has been very resistant to using BPA-free packaging, and the acidity of tomatoes tends to exacerbate the problem. We’ve gone to buying tomatoes/sauces that are in cardboard cartons instead. I’m actually not an eggplant fan either, but I DO miss some pasta dishes every now and then, so will give this a spin. We use some of the Dreamfield’s low-carb pasta from time to time, and I can’t really tell the difference between that, and Prince, however, I’ve never seen a lasagna noodle by them. I’ll probably make the cheesy “bread” sticks to go with this…they’re wonderful, and no flour. The recipe and picture look great. It’s definitely lasagna, not moussaka which has some sort of cream (bechamel?) sauce too. I’ve made my low carb lasagna with both japanese (long) eggplant and zuchinni. I cut them lengthwise to get long strips. I didn’t bother cooking them first, but that would probably cut down on the wateriness of the end product, good idea. For those who don’t like the bitter flavour of regular eggplant, try the long ones instead, they’re never bitter and taste great sliced lengthwise, brushed with oil and bbq’d or grilled (same with zuchinni). Yup, baking the eggplant first is mostly to drive out the water, which makes for firmer lasagna. Tom…lasagna is always best the following day and cold. Love the tip on liver in chili. Now I know what to do with some of the liver I purchased last week. I’d say the same about moussaka. Love it cold. For those that are not eggplant fans, just substitute butternut squash for the eggplant. Just half it lengthwise, scoop out the seeds, then slice it. Boil very gently. Don’t overcook. Let cool. Pick/cut out little hard bits. Chop it up a bit. Add half a stick of melted butter. From pasturedd cows of course. 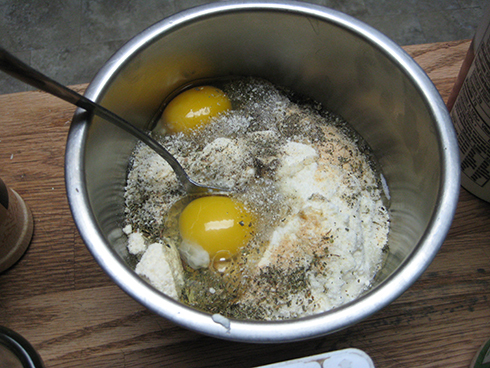 Food process the living daylights of it until smooth and creamy. Natures vitamin! Good warmed up by itself or spread on almond crackers. My dad used to fry slices of eggplant in butter for dinner and must admit I’ve done it too. A go to quick dinner idea for me is grated carrot and zucchini, mixed with egg, then fried as fritters in butter. 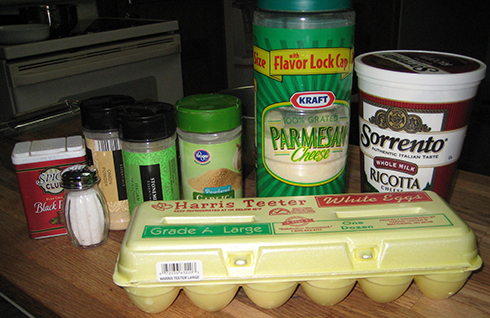 I learned that pre-shredded cheese often contains natamycin (an antibiotic-based mold inhibitor), cellulose powder (aka. wood pulp), and anti-caking agents that often contain potato starch. Additionally, your bag of shredded organic cheese has likely sustained oxidative damage in its processing and packaging”. This from the new book he is promoting and only one of the things he shared about it. The brand Chareva bought does contain potato starch, but it can’t be much since the carb count is still less than one gram per serving. Natamycin isn’t listed. Ok…the “rational” part of me knew that Dreamfields was likely just too good to be true. Cross another one off the list. It’s not quite the same, but we use spaghetti squash for spaghetti dishes. I love eggplant. One of my favorite veggies when cooked. It is great in salads with raw tomatoes and cooked peppers. Dave RN gives a good recipe for the liver pate, but I would use sauteed onions instead of raw ones. Ugh. If only they’d make a meat-and-eggplant variety. I’m thinking this has been answered before, but is there truth to the idea that the low carb thing can make people irritable? Watching your documentary, it seems like the opposite is true. You were happier. Here’s the article I was reading arguing that low carbs make people depressed and angry. What gives? Refined carbs raise serotonin. So does cocaine, but I don’t believe the writer of the article would warn people not to give up cocaine. Some people experience withdrawal symptoms when they give up sugars and refined starches, yes. It passes. My mood is consistently higher now than when I was sending my blood sugar on rollercoaster rides by living on a high-carb diet. The “lasagna” is sitting on the top of the stove, resting. From the smell in the kitchen, I’m going with up so far, but I’ve never been a fan of eggplant. Ok…jury is in…definite winner. I couldn’t even taste the eggplant, and everyone else loved it. I’m glad it was a hit. If you don’t like eggplant, you can always use Zucchini. If you don’t like either substitute with your favorite veggie or just use bacon. Oh and bacon “pizza” is fabulous. Can’t go wrong with bacon! Peter: In addition to what Tom said, I want to point out that at the bottom of the article you link to, it says “Geneva Health & Nutrition is the maker of Levity Mood Elevating Formula”. That isn’t proof that the article is biased, but it does show that the writer has an incentive to exaggerate the effects on mood of a low carb diet. People differ greatly in their biochemistry and hence in their reactions to various diets. So it could be true that some people could be pushed into a lower mood by a low carb diet. We don’t know enough about the research mentioned in support of that article to know whether it was conducted fairly and ran long enough to determine the long-term effects of the switch to low carb (vs. the well-known short-term effects, which might be all that is actually being reported in that article). 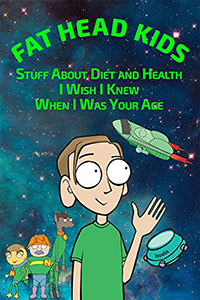 What we do know is that a lot of people who have switched to low carb diets, report that they feel much better than they did on their former diets. Of course, it could be that the people who feel bad on a low carb diet drop the diet and don’t participate in blog/forum feedback, so that proves only that the low carb diet improves the mood of some people. Careful research that I imagine has not been done would be needed to determine more accurately what part of the general population sees each effect. Good points. When some scare stories went around awhile back about low-carb diets making people sad or cranky, they were based on studies in which researchers checked subjects’ moods mere days after starting them on a low-carb diet. a bit off topic (as usual 😉 ) but I’ve been thinking about my wheat intake. We all have our food “treats”…those things we find hardest to do without. For me, I have two categories. 1) Sandwiches, and 2) Chips. I’ve found low carb alternatives to bread that allow me to satisfy my sandwich cravings, that being the flax oat bran pockets that are 4 net grams each. I use them for tuna salad and chicken salad, and lately I’ve been on a BLT kick. For chip cravings, I buy the flax oat bran “lavash” rollups, cut them into triangles, and fry them in either EVO or coconut oil, and dust them with kosher salt while they’re still warm. I keep them in a zip lock, and whenever I want chips and salsa, fresh guac, or chips with a sandwich, they’ve become my “go to” alternative. The downside to these substitutions is that while they are pretty low carb, they both contain wheat. I’ve reduced my wheat intake to these two items, so I’d say that overall, I’ve probably cut back my wheat intake about 90%. Has anyone discovered other alternatives that are wheat-free? I actually tried that when you posted the recipe…may have to give it another shot…didn’t quite do the trick at the time…seemed very custardy/eggy. The lasagna was custardy? Maybe it needed to cook longer. Looks good, I may have to try this. Although technically your white sauce is just a cheese filling, white sauce being flour, butter and milk. I know I am being that guy. On a side not in regards to the almost paleo bread recipe, it is difficult to find almond butter in a 16oz jar. Most major grocery stores only carry 12oz. We found the 16-oz jars at Costco. No…sorry for not being more clear. The almond butter bread was custardy. The lasagne was delicious. It seems like you can find Low Carb bread recipes, and Paleo bread recipes, but I haven’t found any Paleo Low Carb bread recipes. Made this tonight with 1lb ground lamb and 1lb italian sweet sausage. We didn’t have cheese so I made the white sauce with a slight modification to the seasonings (added a steak rub, some thyme and another seasoning mix), made it with 4 eggs instead of just 2, used a can of Trader Joe’s coconut cream and sprinkled in some almond flour. I also used almost two cans of TJs tomato sauce (like you said, no added sugars) and sprinkled a dusting of almond flour and flax seed on top. Baked it for about 70 minutes at 350. My wife (who cringed last night when I told her I was going to make it) ate two servings. Thanks for the great ideas! Good improvisation, and it obviously turned out well. Wow. Seriously, what a great dish. I saw this a few weeks ago and made a mental note that I wanted to give it a whirl and it was so good! Thank you so much for sharing! i finally tried it. wow. best lasagna ever!